“Hi Matt! Hi Carla! How are you guys doing?” says Duke Ratanakarn, owner and main Chef at Faceless Samurai, as he warmly welcomes my husband and I in, with the same big smile and charisma he greets every single person that walks through his doors. “It’s been what… 7 or 8 months since you guys got married? Congrats again!” Duke adds, as we take a seat at the bar, because we love catching up with him. I have no idea how Duke manages to remember every single detail we’ve ever shared with him, but he does. And that same attention to detail is reflected in every single piece of sushi he masterfully rolls, and his guests definitely notice. “I love the thai food there, and sushi chef Duke is incredible, he truly knows how to make my tummy happy!!! His sushi skills are top notch!” says regular, Paweena K.
If you live around the East Lake area, a simple google search on “The best sushi restaurant near me,” will prompt you to Faceless Samurai as the first result, and you’ll notice the impressive amount of 5 star reviews from happy, satisfied clients. “Beautiful, very traditional Japanese looking place. Sushi was awesome. 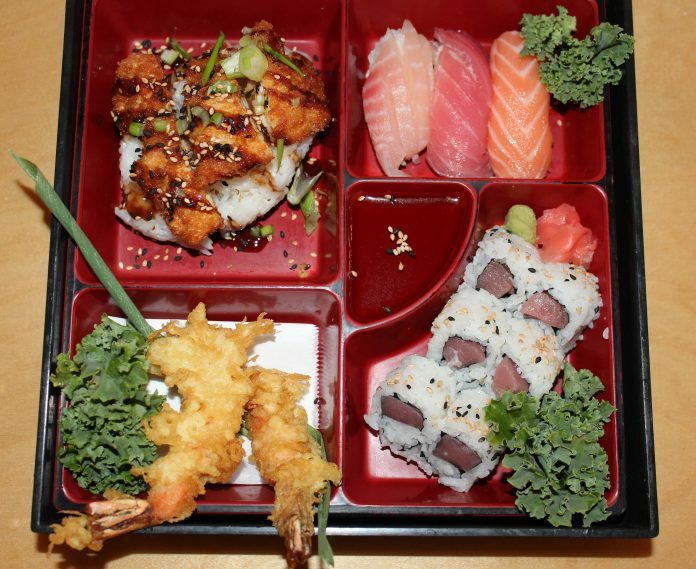 They had great lunch specials on bento boxes! Our waitress was really nice as well and service was fast. This is my new favorite sushi spot for sure!” says Jacqueline V.
Of course, all the magnificent food has a lot to do with the wonderful reviews, but for me and my husband, the delicious food comes second to the superior customer service and treatment we get every time we stop by. 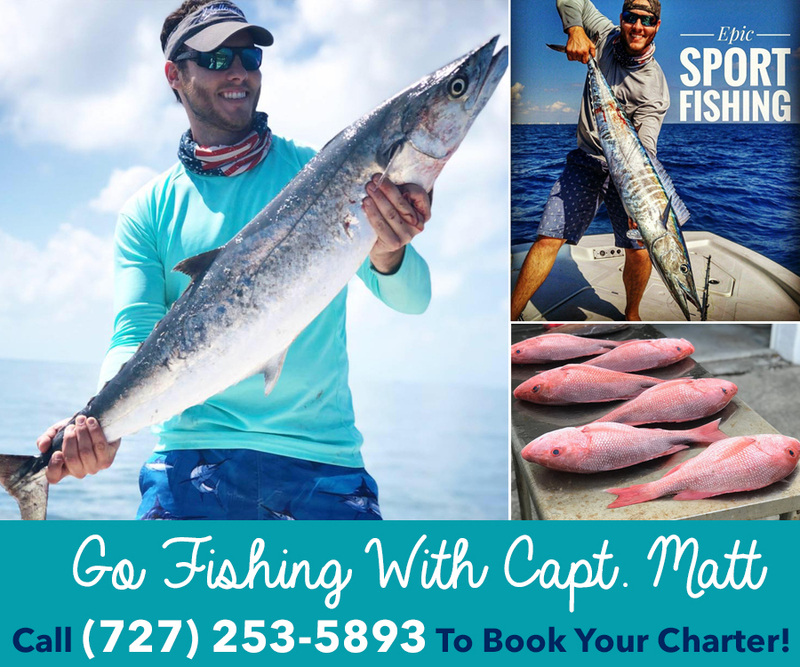 Duke, my husband Matt and I go way back… back to the days Matt and I first started dating, and as a couple of self proclaimed foodies we were trying every single high-rated sushi restaurant in the area. After our first dinner date there I completely fell in love… with Faceless Samurai! And if you pay Duke a visit, and allow him to surprise your tastebuds with some of his incredible creations, you too will fall in love with this amazingly delicious neighborhood gem. Now that you know Duke will be one of the main reasons’ you’ll keep going back, let’s talk about the food! 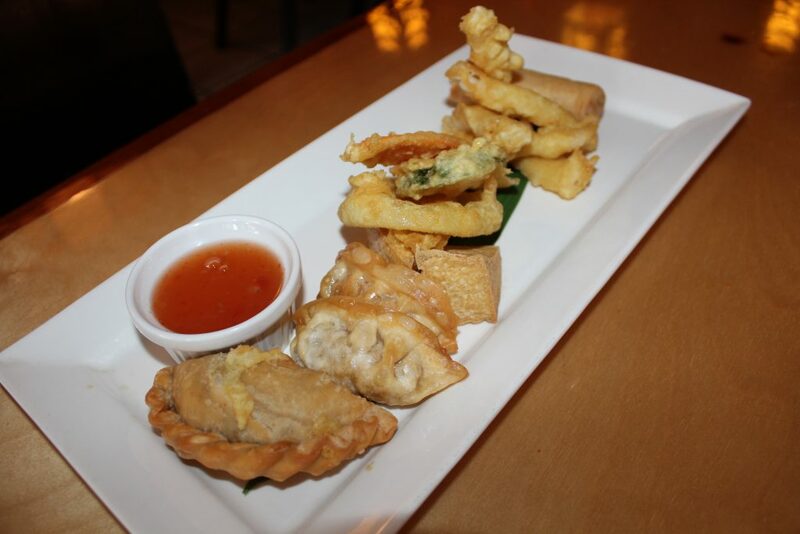 We started our dinner with the “Samurai Sampler,” because we like to try a little bit of everything… and if that sounds like you, I recommend this as your main starter as well. It offers a few pieces of fried tofu, gyozas, fried calamari, spring rolls and a savory curry puff, all for a very affordable price, I must say. Last time we stopped by, we had a variety of special sushi rolls and the drunken noodles, which were amazing. So this time around I wanted to try something new… and I am so glad I did! In the same spirit of “tasting a bit of everything,” I went with the Bento Dinner Box because of all the options I could choose from. 6 pieces of tuna or salmon maki, tuna or salmon salad. Choosing was hard but I went with; the 3 pieces of sushi of the day, which included fresh tuna, fresh salmon and snapper. 3 pieces of chicken katsu, which I had never had before and I couldn’t get over how exquisite this was. I will make sure to order it every single time I go from now on. I also included 2 pieces of shrimp tempura, because it’s one of my all-time favorite things to eat, and then last but not least, 6 pieces of tuna maki, because I knew my husband was going to steal them from me since he’s a big fan of tuna. 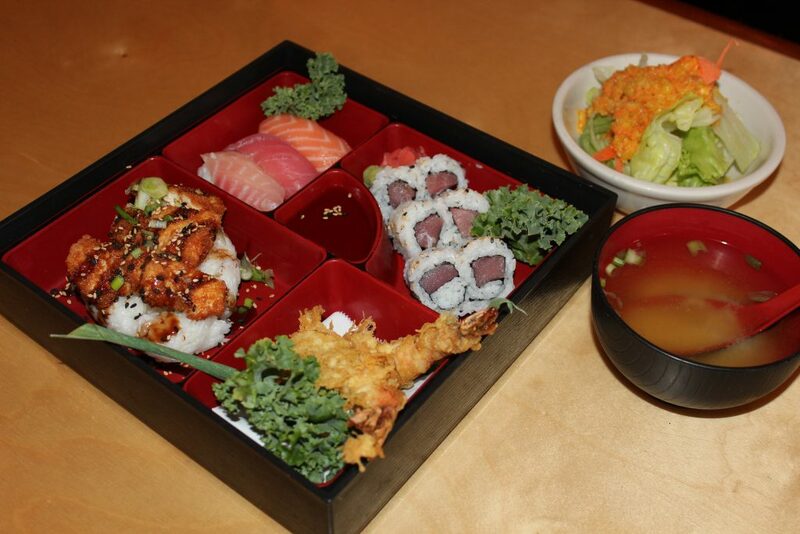 The bento dinner box was a hit and there was plenty enough food to share, even though you probably wouldn’t want to! My husband ordered the volcano roll, which we had never tried before at Faceless Samurai, and it definitely did not disappoint. Nothing that Duke makes ever does. 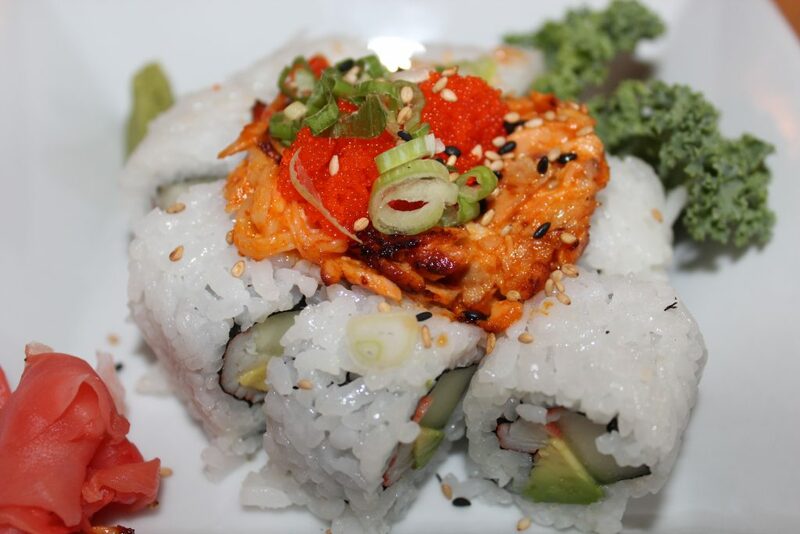 This traditional roll had spicy baked seafood on top of a california roll and it was finished off with tempura flakes. It was delicious and the perfect amount of spicy! When we were down to our last piece of tuna maki, Duke surprised us with a special roll, which he’s still coming up with a name for… but if you ask him to make you the same roll he made for “Matt and Carla when they came over,” he will remember, I can promise you that! Not only he is an amazing chef, he has the best memory of anyone I know! 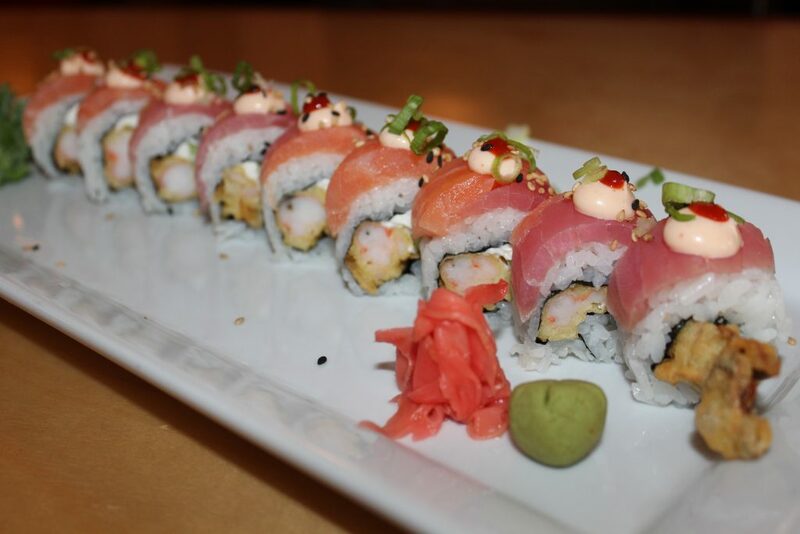 This special roll included some of my favorite sushi ingredients; shrimp tempura, cucumber, cream cheese and it was topped with fresh tuna and fresh salmon. Yum! I am so happy this will be added to their menu. You will not want to miss this! I personally cannot wait to try all these new rolls! If there are half as good as the one he let us try today, I am sure they will all become big hits! Even though we were already full, there’s mysteriously always room for dessert. So we finished this incredible meal with some Mochi Ice Cream. Which if you’ve never had, I encourage you to try it. 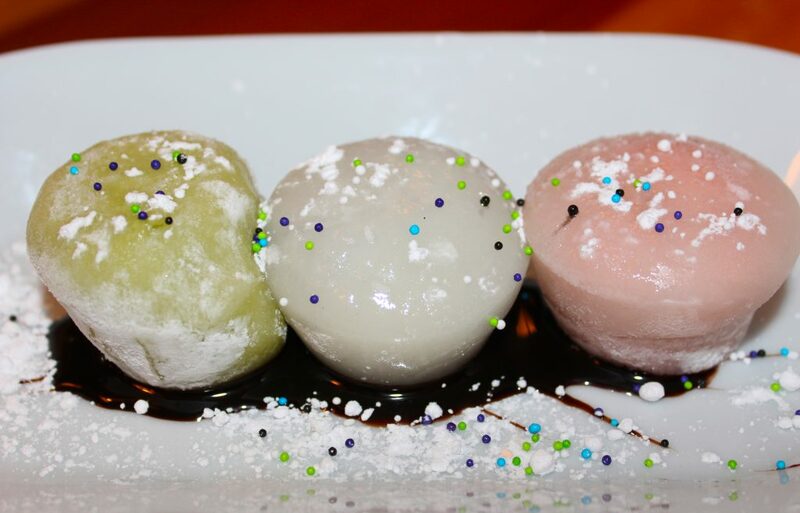 Sochi is a confection made from Japanese dough (mochigome) with an ice cream filling. This dessert is surprisingly tasty and believe it or not… gluten free! Faceless Samurai also offers a nice wine and local beer selection, as well as Japanese sake and imported beers. If you’re looking for delicious Japanese food at affordable prices, and an unforgettable experience with a friendly Chef who will treat you like family, visit Faceless Samurai today! Faceless Samurai is located at 3428 Tampa Rd, Palm harbor, FL 34684. Call them directly at (727) 772-5622 or log on to facelesssamurai.com for more information. Previous articleSave Money, Save the Planet, Go Solar Today! Act now and capitalize on the 30% Federal Tax Credit!